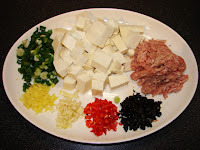 This is very similar to Mapo tofu but with a Cantonese flavour and there is no chilli bean sauce for this recipe. I think it is as nice as Mapo. Don't use black bean sauce in a jar for this recipe, it's not right. Heat the oil till very hot, add garlic, mince and dash of soy sauce stir till the meat is browned and very dry i.e. no more liquid remaining in the pan. Add ginger, chilli and black beans and stir fry till fragrant. Add a splosh of cooking wine stir then add in stock or water, sugar and oyster sauce to taste. Bring the liquid to boil then add in the tofu pieces. Simmer for few minutes then add in the slackened cornflour to thicken. Heat off and add in pinch of ground pepper, spring onion and sesame oil. For vegetarian use chopped shitake or normal mushroom, can also add some chopped bamboo or finely chopped carrots. Sounds lovely. 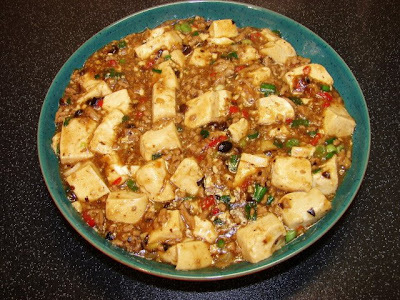 I love ma po tofu, and I'm sure i'd love this.